An innovative camera system could in future enhance security in public areas and buildings. Smart Eyes works just like the human eye. The system analyzes the recorded data in real time and then immediately flags up salient features and unusual scenes. "Goal, goal, goal!" fans in the stadium are absolutely ecstatic, the uproar is enormous. So it's hardly surprising that the security personnel fail to spot a brawl going on between a few spectators. Separating jubilant fans from scuffling hooligans is virtually impossible in such a situation. Special surveillance cameras that immediately spot anything untoward and identify anything out of the ordinary could provide a solution. 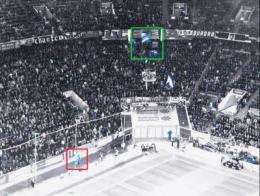 Researchers from the Fraunhofer Institute for Applied Information Technology FIT in Sankt Augustin have now developed such a device as part of the EU project "SEARISE - Smart Eyes: Attending and Recognizing Instances of Salient Events". The automatic camera system is designed to replicate human-like capabilities in identifying and processing moving images. Like the human eye, it can, for instance, distinguish objects when observing a scene, even if the objects are moving in front of a very turbulent background. The Smart Eyes system analyzes the video data in real time and immediately points out salient features. "That is invaluable for video surveillance of public buildings or places," says Dr. Martina Kolesnik, research scientist at the FIT. "In certain circumstances the capabilities of a human observer are limited. Ask someone to keep an eye on a certain stand in a football stadium and they are bound to miss many details. That same person can only carefully monitor certain sections of the whole area and will quickly get tired. That's where Smart Eyes clearly comes into its own." The system hardware consists of a fixed surveillance camera which covers a certain area, and two ultra-active stereo cameras. Like human eyes, these can fix on and follow various points very quickly in succession - but also zoom in on details. At the heart of Smart Eyes is innovative software that automatically analyzes the image sequences. It replicates key strategies of the human eye and brain. Taking its lead from the flow of visual images in the brain, the software has a hierarchical, modular structure. It initially ascertains the degree of movement for each pixel, thus identifying the particular active areas in the scene. From this it learns motion patterns and stores them as typical models. On the basis of these models the system then identifies events and classifies them: for instance the software can distinguish between passive spectators and fans jumping up and down. Image patterns such as empty seats or steps are also identified. The application picks out salient events and focuses on these using the active stereo cameras. Depending on the priorities set by the security experts, various events are designated as salient. The program can, where necessary, filter out objects such as flags being waved to focus specifically on other salient events, for instance a person on the edge of the pitch. "Our image analysis software is compatible with camera systems produced by all vendors. It can be installed easily. The user doesn't have to make any adjustments," says the researcher. The Smart Eyes system will be on show at Security Essen 2010 from October 5-8, 2010.